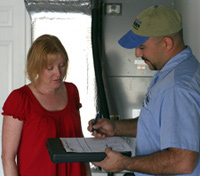 Choosing an air-conditioning company is an important homeowner responsibility. To make an educated decision we encourage our customers to seek out recommendations from our many satisfied customers. We Take Our Customers’ Satisfaction Very Seriously! Modern Services is proud of the positive experience of our customers and we work hard every day to earn your trust and back it up with a 100% Guarantee of Satisfaction.